The aim of this study was to measure the effect of various power outputs on muscle coordination. Turpin et al. (2011) conducted this study on eight untrained male subjects (UNT) and seven experienced male rowers (EXP) as they hypothesized that if rowers do most of their trainings at lower power outputs compared to competition it might result in adaptation to different muscle coordination. UNT had no experience with rowing or rowing ergometer. 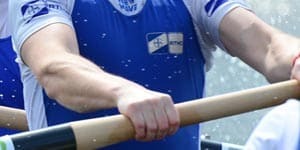 EXP had 10.4 ± 4.2 years of competitive rowing experience and trained approximately 11.6 ± 3.2 h per week at the time of the study. All subjects were asked to perform three 2-minute constant load bouts of rowing on an ergometer (Rowperfect) at 60, 90 and 120% of the mean power output of their maximal 2000m performance. During the tests, surface electromyographic (EMG) activity of 23 muscles was recorded. UNT had performed an all-out 2000m rowing test one week earlier as a baseline measure. 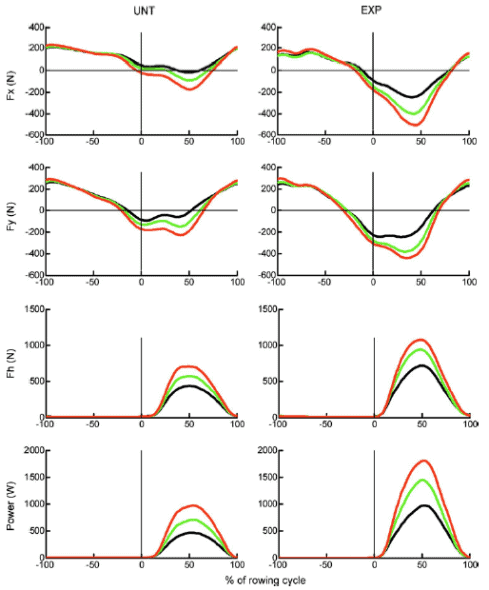 Although the results showed a significant increase in EMG activity during the exercises, no significant modification in the shape of individual EMG patterns or the timing of activation was observed. It was concluded that despite significant changes in the level of muscle activity, the global temporal and spatial organization of the motor output was very little affected by power output on a rowing ergometer. Most of the training sessions are performed at a lower power output than the power output at 2000m all-out performance. Nevertheless, it is not problematic from the point of view of motor control as individual muscle coordination and control were not significantly altered at different power outputs. Turpin NA, Guevel A, Durand S, Hug F. Effect of power output on muscle coordination during rowing. European Journal of Applied Physiology, 2011; 111: 3017-3029.